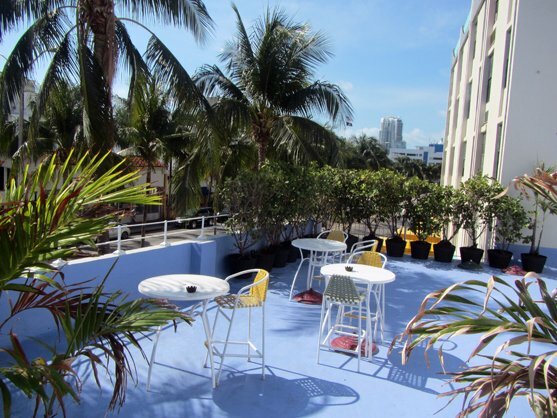 The charming Royal South Beach Hotel provides a fusion of past, present and future. The 42 brightly colored rooms feature kitchenettes, cool marble floors, all-tile bathrooms, digital safes, free WIFI, and cable TV including HBO. 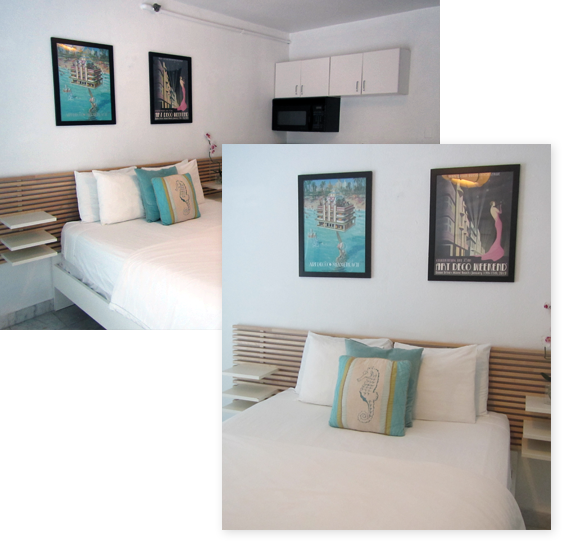 The new Royal South Beach offers comfortable accommodations at affordable rates. 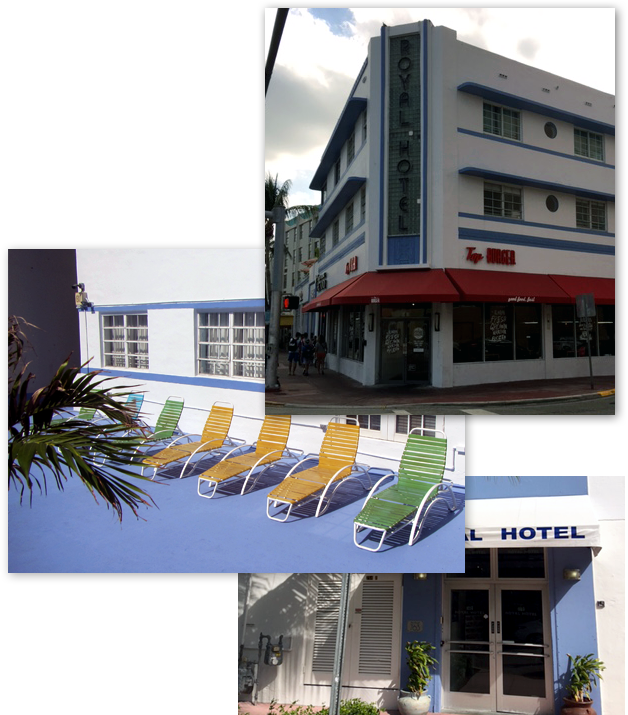 Located on Washington Avenue @ 8th Street, the Royal is only two books to world famous Ocean Drive and the sugary white sands of Miami Beach. It is in the heart of South Beach only steps to the Entertainment District, a variety of restaurants, outdoor cafes, fashionable shops, culture, exciting nightlife options and clubs. Our guests travel from all over the world and locally to experience the hospitality of our attentive staff and feel at home at this adorable South Beach hotel. You can dream, explore, party and then relax on our sun soaked terrace overlooking the scene on Washington Avenue. Indulge yourself at this historic boutique hotel featuring an on-site bar and two popular eateries. The Royal was built by a former Zeigfield Follies showgirl who hired two of Miami Beach's most renowned and prolific Art Deco architects. Henry Hohauser designed the ground floor in 1936 and L. Murray Dixon designed the two hotel floors which were completed two years later. During World War II the Royal proudly served as barracks for the Army Air Corps recruits who trained on Miami Beach. The Royal South Beach was completely renovated by internationally celebrated architect/designer Jordan Mozer who enhanced the Streamline Moderne architectural design by adding modern technology and design to its 1930's character. Book a room at the Royal where you will be treated like royalty and be sure to check out our sensational Internet Specials with super discounted off-the-rack rates by the day, week or month depending upon availability! Wonderful experience! I love the fact that chairs, umbrellas and mats were included in the room. Well located Hotel near Ocean Drive in Miami Beach. Easy to go anywhere by bus or car. The staff are great. 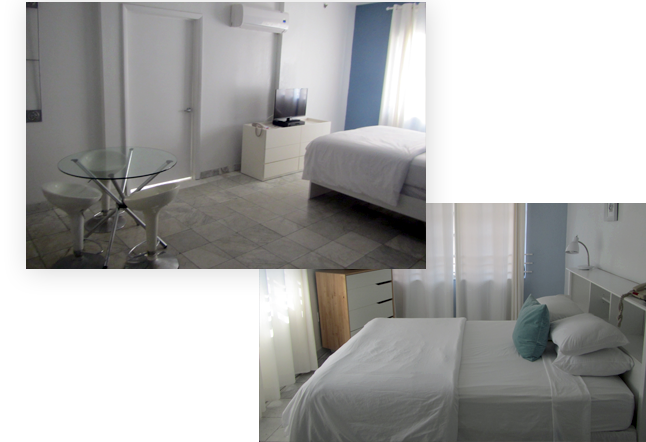 Great place for the price, the rooms are big enough, clean, well-equipped, have kitchenettes. The best location in South Beach, 5 mins walk from the ocean, 8th and Washington/Pennsylvania ave. In the middle of everything but rather quiet at the same time. I had a great stay here 2 blocks from the beach. Perfect location, very nice and helpful staff on the front desk. The unique, historic Royal Hotel South Beach is at the center of South Beach. The Royal Miami Beach Hotel was was built by a former Zeigfield Follies showgirl and designed by Miami Beach's two most renowned Art Deco architects. Henry Hohauser designed the ground floor in 1936 and the second and third floor hotel addition designed by L. Murray Dixon was completed in 1938. The unique look of the Royal Hotel South Beach is the masterful vision of famed designer Jordan Mozer, who is known for his contributions to such innovative projects as the new Cheesecake Factory in Chicago, House of Blues, the Bellagio, Mirage and Venetian Hotels in Las Vegas, and Barney's New York. The unique experience at this Miami Hotel is unbeatable. No other Hotel in Miami Beach has what this one-of-a-kind property has to offer. Come and explore not only this unique south beach hotel but enjoy all the action surrounding this amazing Hotel in South Beach. At the Royal Hotel Miami we know than when you look for a hotel in south beach, you look for the best. You will find comfort and convenience with great style at this Miami hotel with hi-tech amenities and intriguing modern surrealist artwork.